Day 2 and I was back in 7th grade classes to talk with them more about bullying. Yesterday's lesson took the whole period and there was little time to process and discuss the presentation and activity. I used the first part of the period today to wrap up. about bullying, but now I think____________________. I asked them to fill it out by thinking back to yesterday before class started and to compare it with what they believe now. When they finished writing, I asked them to stand in the front of the room with their slips. When they were all standing, I asked them to try to be as quiet as they could. You could hear a pin drop in the room as they stood there. I then asked them to quickly, but without talking, line themselves up in order from shortest to tallest. When they were finished, I asked them to share their answers with the person next to them. When they were finished, I had them quiet themselves again, and without talking line up by birthday (month and day). When they were done I had them check their work by calling out in order their birthdays. And once again, I had them share with their neighbor, their answers. We did this for a third round by shoe size. It was fun to see them try to size up their feet. Several kids in each class didn't know their shoe size and we had shoes off and all kinds of comparisons going on. When we were done, I had them return to their seats and then I asked them what the activity had to do with bullying? We needed to use teamwork to line up and we need to use teamwork to wipe out bullying. We were quiet and had fun. We didn't argue or fight. If we keep our comments to ourselves, everyone will feel good. At first I thought bullying was a rare occurrence in our school, but now I think that I remember several occasions when I have witnessed bullying and didn't recognize it for what it was. At first I thought that a lot of people here didn't care about bullying, but now I think that the issue is at the forefront of everyone's mind. At first I thought the only way to stop a bully was to show them what they're doing to everyone else, but now I think that you only sink to their level. Instead of bullying them back, stick up for yourself and others. At first I thought it didn't make people so sad, but now I think it hurts people really bad! At first I thought that bullying wasn't happening that often because I didn't see it, but now I think that it's cruel and awful and it should stop. At first I thought that bullying was wrong, but now I know bullying is wrong and I want to do something to make it stop. At first I thought that bullying was wrong, and now I think bullying is still wrong but it's a problem you CAN fix! There were many more responses just as great as these. I like how insightful they are. 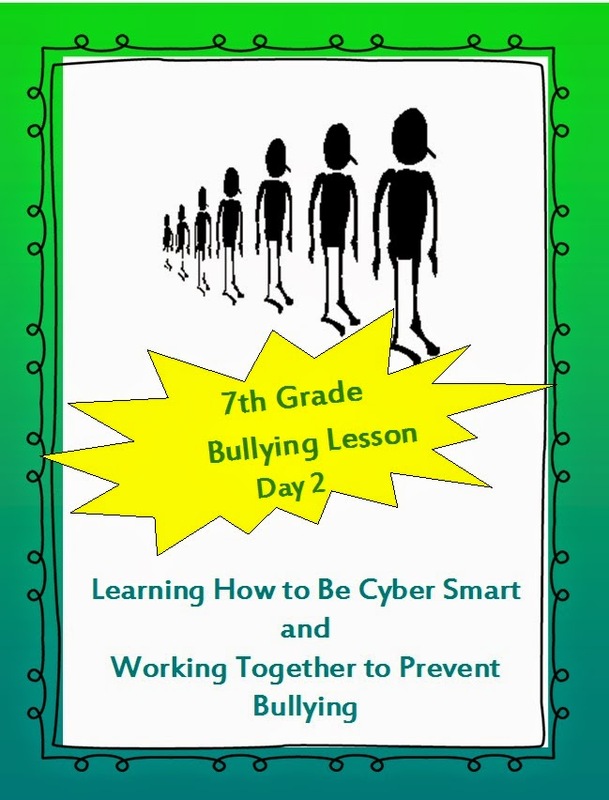 After our activity, I used my Cyber SMARTS discussion lesson (found here). 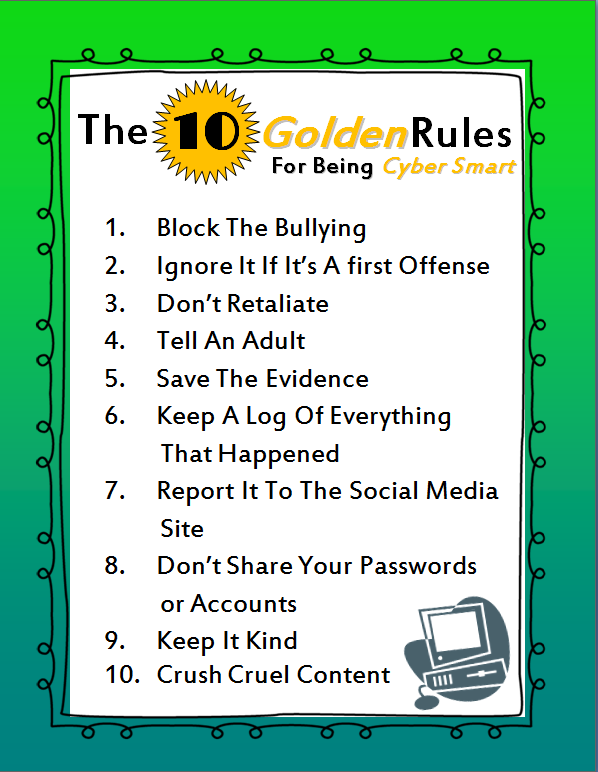 We went over the rules of being Cyber SMART and then I passed out the situation cards. Kids read the cards and then we discussed as a group what they would need to have done differently or should do in that situation. I had two days, but I could have used two weeks. All-in-all, there was a lot of great conversations and we now have a starting point for taking responsibility of our actions--both in person and online. I loved your post. I'm writing for 1ws.com and I've been reseaching this topic for a while. Team building activities are designed such that people who are in an ineffective team are given higher preference than those who have been effective team players. If you too have a sizable organization, you ought to pick fun team building activities for work that will suit your company.